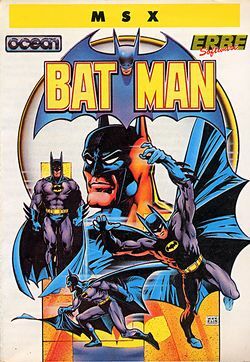 This is the first game in the Batman series. For other games in the series see the Batman category. The object of the game is to rescue Robin by collecting the seven parts of the Batcraft hovercraft that are scattered around the Batcave. The gameplay takes place in a 3D isometric universe, which programmers John Ritman and Bernie Drummond would develop for 1987's Head Over Heels, and is notable for implementing an early example of a system that allows players to restart from an intermediate point in the game on the loss of a life rather than returning all the way to the start (in this case the point at which Batman collects a "Batstone"). This page was last edited on 28 February 2017, at 09:00.